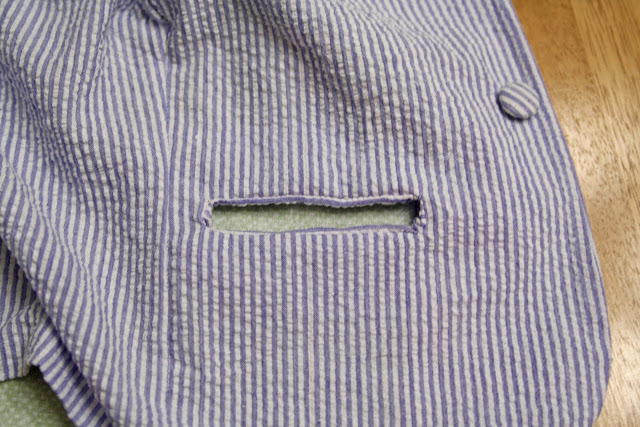 Welt pockets! In this tutorial I’m going to show you how I made them. DISCLAIMER: Before I made these, I looked at lots of blogs and googled and I decided the “right” way to make welt pockets was giving me a headache – especially because the “right” way differed ever so slightly from tutorial to tutorial. 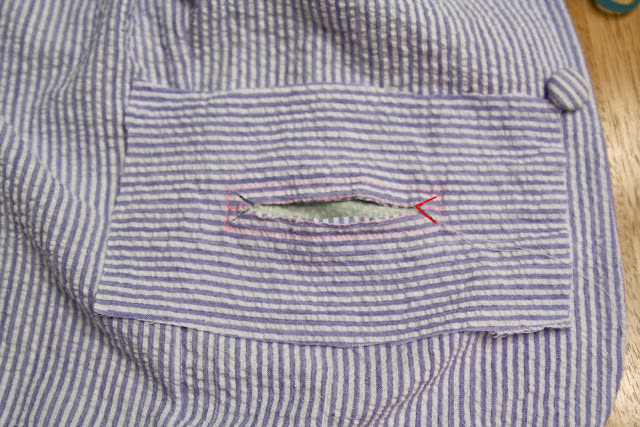 So I did it in a way that made sense to me (without a lot of math, because I was tired of math that day) and I AM ABSOLUTELY SURE THIS IS NOT THE “RIGHT” WAY TO MAKE WELT POCKETS. But it worked. First, I cut out two rectangles. I just eyeballed them (tired of math, remember?) and cut them WAY bigger than I needed. My actual pockets ended up being 3 1/2 inches wide, and that was the only measurement I took. On each rectangle, I drew a rectangle in the middle with a line down its center. 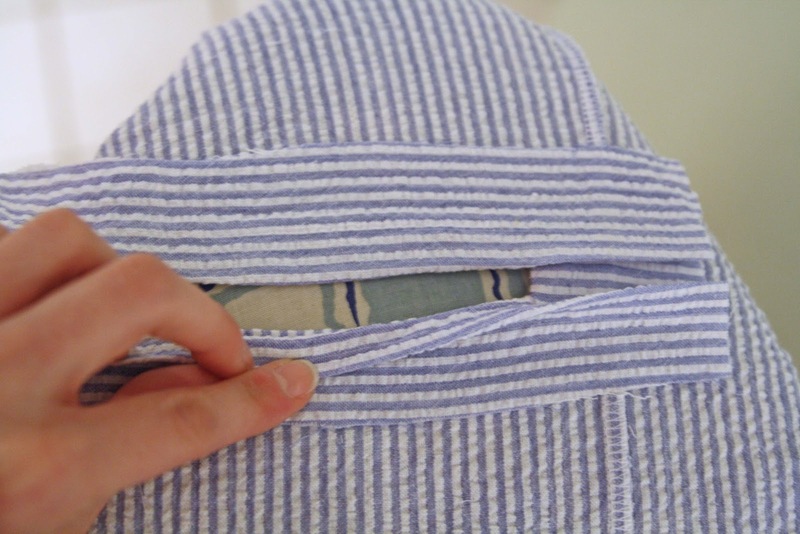 Now this will be your pocket opening, so do take time to line it up properly on your jacket. You need to put it on the outside of the jacket, right side down. As an aside, I did this as the second to last step on my blazer, right before I sewed the last part of the lining to the jacket. I don’t recommend doing that – you should probably do this as one of the first steps, before attaching the front facing, even. 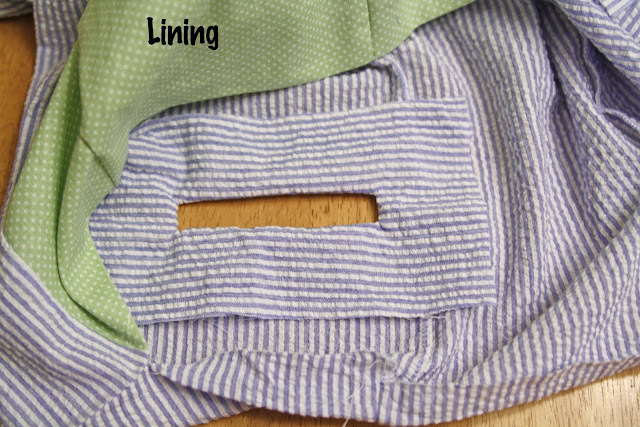 Now, sew around the outside of the rectangle. 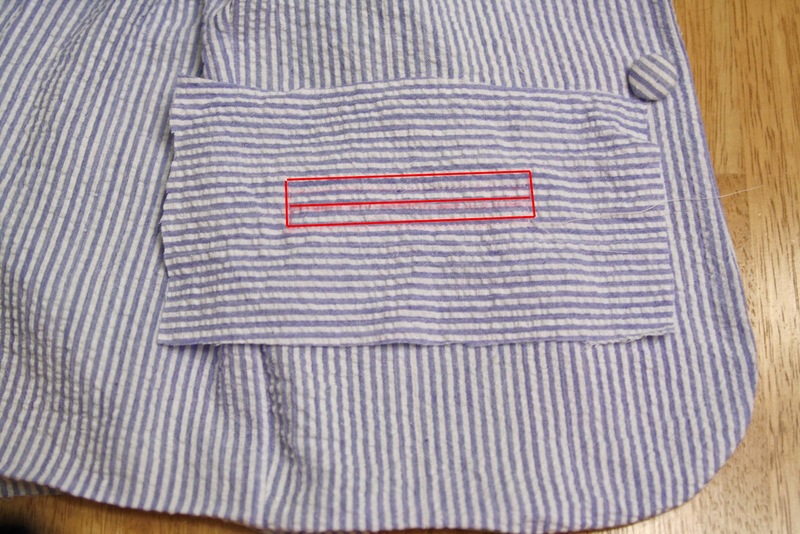 Next, cut the center line through both layers, stopping about 1/4″ before the stitching. Clip into each corner in a Y shape, being careful not to clip through the stitching. Below right, I drew lines on the Y so you can see it better. Now stuff the new rectangle through the hole you’ve made. Now press this really flat. Next, you fold up the extra part of the rectangle until the folded edge hits the center of your opening. Do the same with the extra part from the top. Press flat. What it looks like on the front now. Sew in the seams (stitch in the ditch) across the top and bottom, and up the two sides of the rectangle to secure the welts. Now you can cut off all that extra fabric from the extra big rectangle, but leave yourself at least 1/2 inch of seam allowance to attach the pocket. 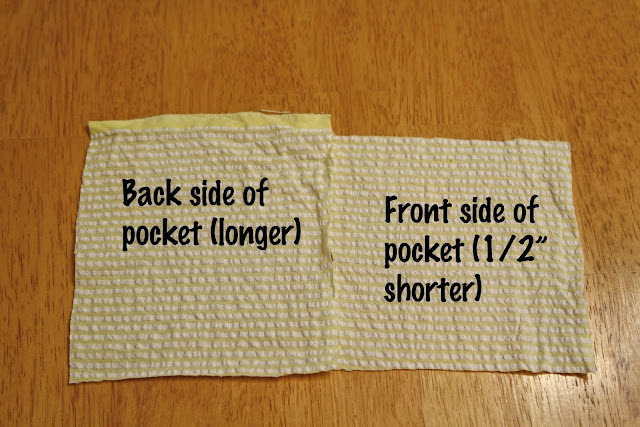 Now you need to cut out lining fabric for the pocket. One side should be 1/2 longer than the other, and they should be as wide as the opening plus seam allowances. I just held my fabric up to the back of my jacket piece and eyeballed it again. 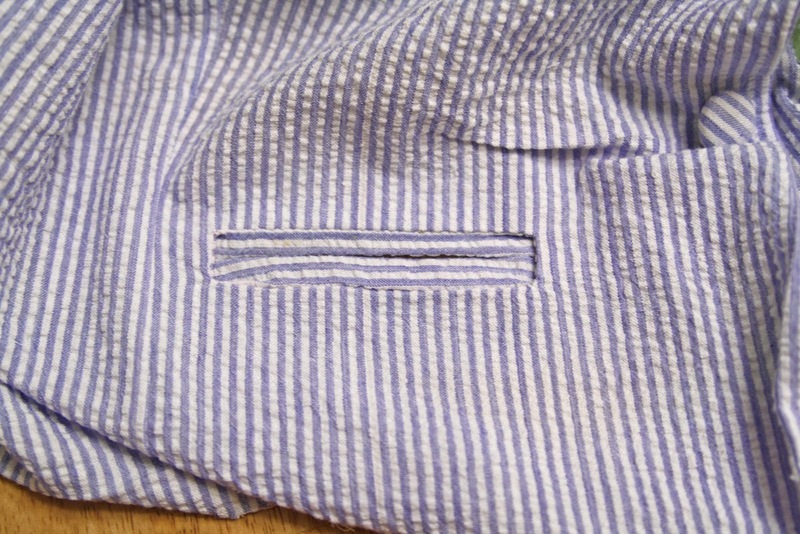 Take the shorter pocket piece, and lay it pointing up with the edge covering the bottom welt seam. This should be wrong side up if your fabric has a right/wrong side. Pin in, then flip the jacket over to the right side and sew in the bottom of the welt seam again (sorry, no pic of this). When you flip this piece down, the raw edge will be covered. 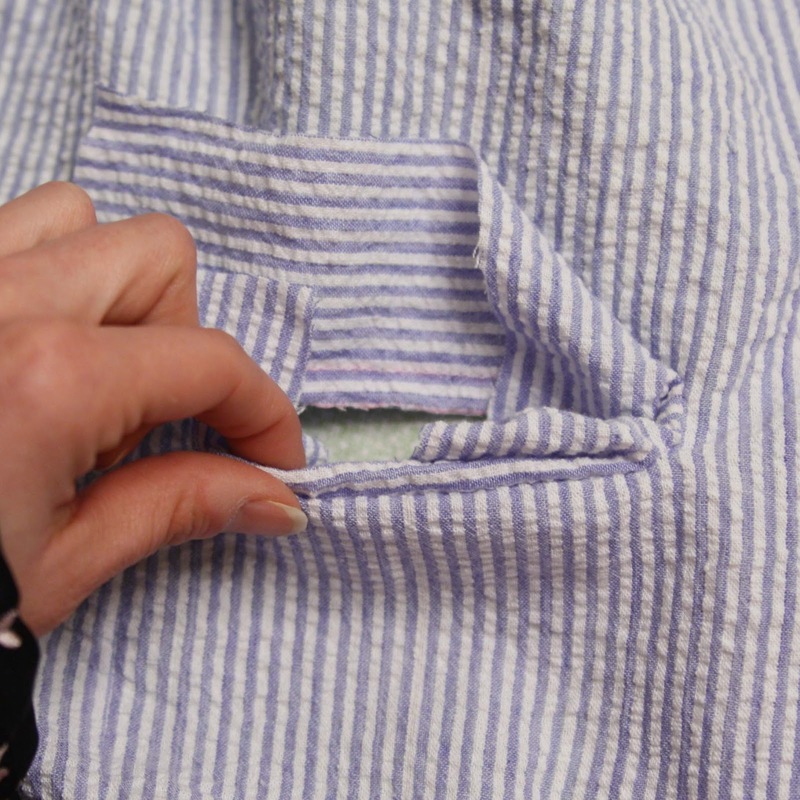 Now, lay the other pocket piece over it, right side down. 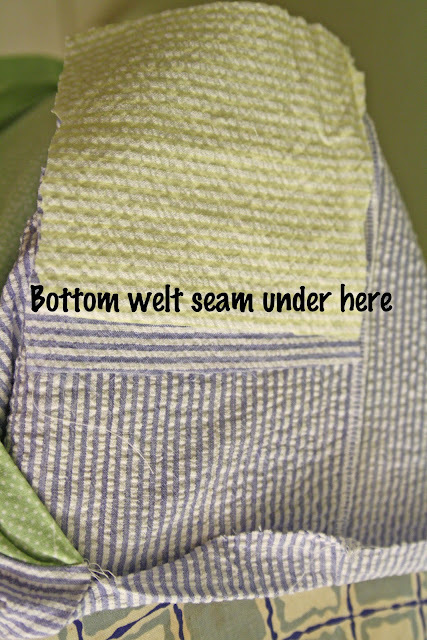 Make sure the top edge covers the top welt seam. 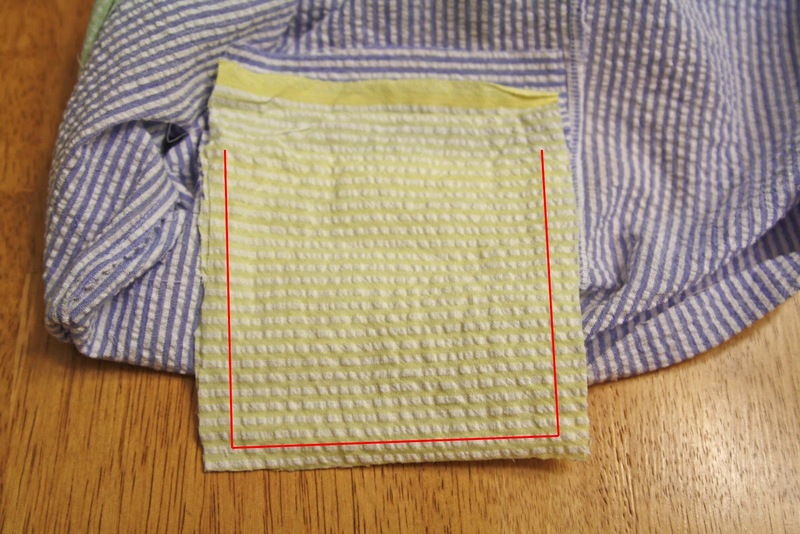 Sew around the edges as shown in the picture. 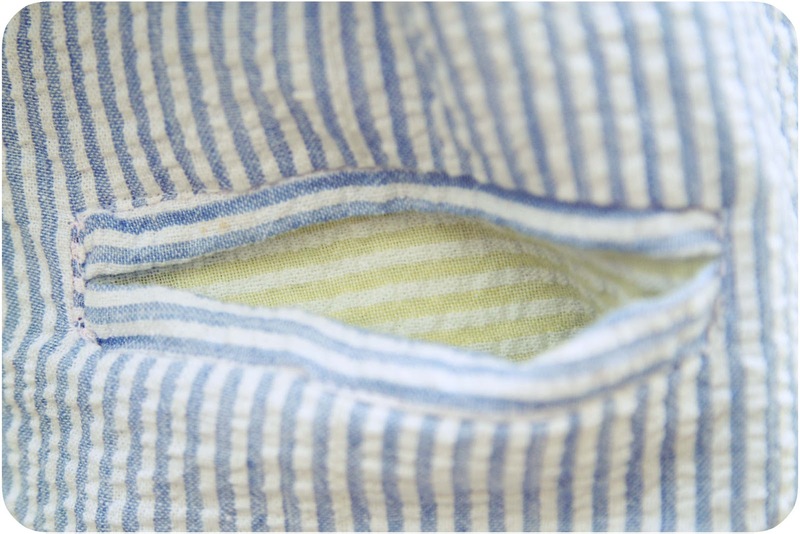 Finally, on the front side, sew across the top and sides of the welt opening, but do not sew the bottom! If you do you’ll sew your nice new pocket shut. Get out of here! 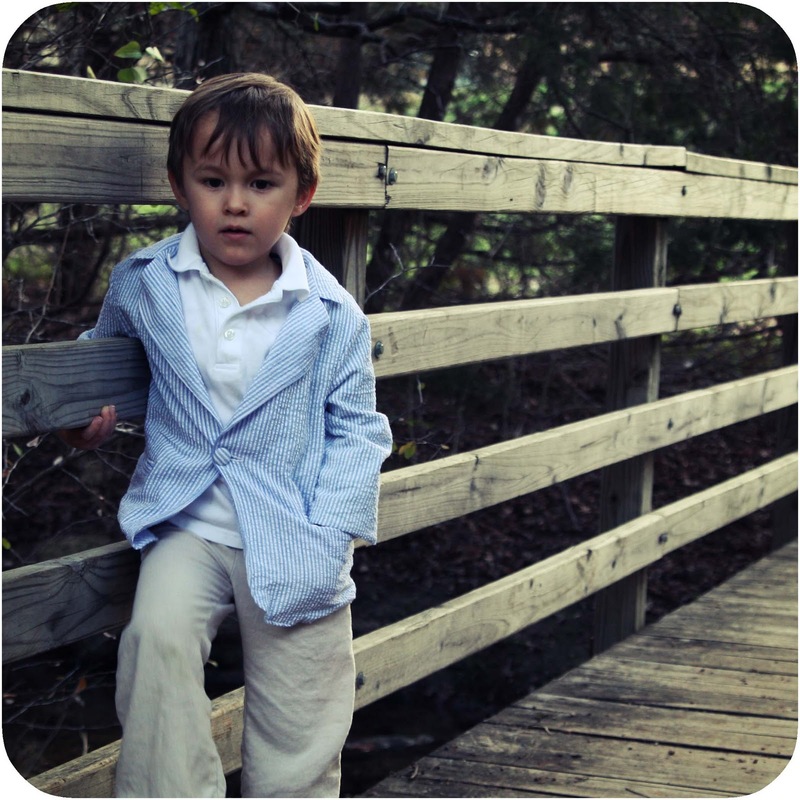 Your little man is looking so handsome! Love this jacket and the pockets. Pockets are my favorite! I agree with Kara, you have a budding heartthrob on your hands! I cannot wait to try this! Thanks for sharing–great instructions! I literally just spent two hours figuring our pockets with a welt for my husbands coat. If only I had seen this post sooner! This is EXACTLY how I was taught to make welt pockets! They are so much easier than they look! Yours turned out nicely too. Thank you so much for this. I’ve had a terrible time trying to make welt pockets. You’re system was not only the the easiest to follow but helped me make the best looking welts I’ve done. You’re awesome! !